Despite having to keep things low-key this year, I most certainly did not want to be caught without a special beer for my favorite holiday. I put off making my purchase a bit later than usual and started to worry a bit I when couldn’t turn up any of my annual favorites. Fortunately, the folks at Stone Brewing had my back and this bottle pretty much screamed out to me from a store window as I was walking to the train station the other day. 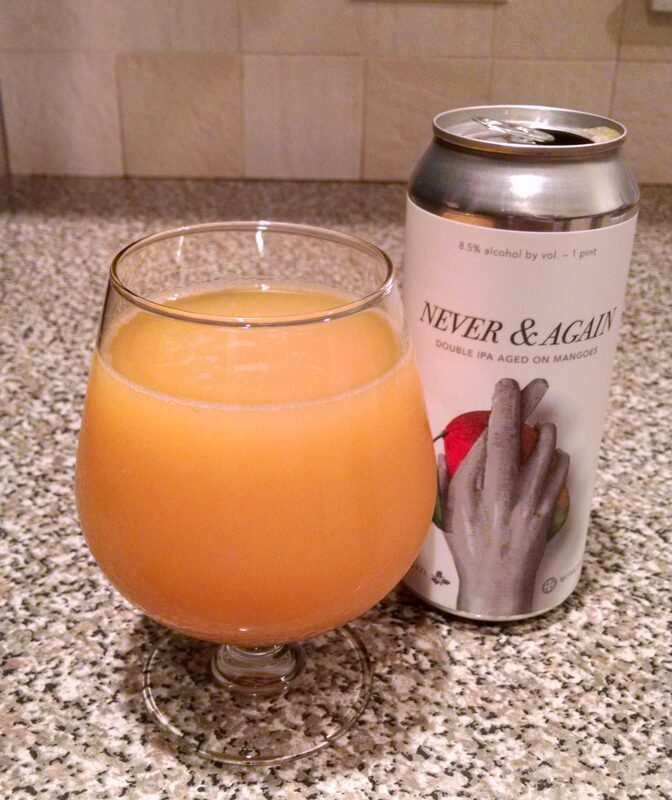 Description: You can find a full write-up of this “frighteningly fresh” brew on the company website here, but basically this is an Enjoy By offering with a twist – pureed tangerines (because they’re spooky?) were added to the aggressively hopped recipe for this release. The 22 oz. bomber cost me $8.49 at a bottle shop in Chinatown. Appearance: The beer had a see-through amber/orange body topped off by a thin fizzy white head. With a slightly more aggressive pour, I was able tot coax a thicker foamy covering out for the second glass. Smell: Burst of tangerine juice as soon as the bottle was opened. A more subdued sweetness followed, mixed with piney hops. Taste: Tangy, juicy tangerine sweetness mixed with piney hop bitterness. The finish was a blend of tangerines, citrus zest, and resinous hops that oddly gave the beer something not entirely unlike a fall spice flavor that brought on a zesty, resinous aftertaste. The sweetness and bitterness got more in tune as the beer sat for a bit, with the resin and zest finish remaining throughout the pour. Alcohol was well hidden. Mouthfeel: Medium bodied with a touch of creaminess. Carbonation was moderate overall, but seemed to consistently leave me with plenty of tiny bubbles at the end of each sip. Hype: As I mentioned in my last review of a beer from this series, these releases tend to be well received but don’t quite fly off the shelves the way they once did. 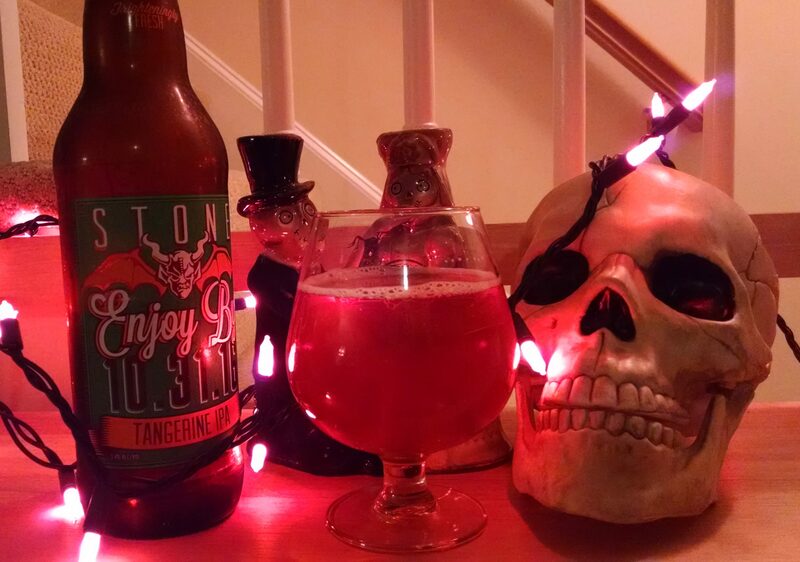 Personally, I’ve been a longtime fan of Stone and was happy to have a “worthy” beer to celebrate Halloween with. Overall: Not bad on the whole, but at the same time not a standout for me. I definitely prefer the regular entries in this series over thisrelease. It was the finish that turned me off a bit, with the combination of tangy zest and bitter hops not quite coming together in a way that suited my preferences, imparting the unexpected spicy taste described above. Tough month for fruited DIPAs around here, leading me to think it might be time to declare stout season as officially open. Regardless, have a happy and safe Halloween! Have a spooky brew (or few) for me!!! As some of you may recall I read Leviathan Wakes, the first installment in The Expanse series, a few months back. While not exactly blown away, I did see some potential in the series and decided to give the next book a chance just to see how the story would develop. Minor spoilers for Leviathan Wakes can probably be inferred from the paragraphs that follow, but everything is largely spoiler free. Caliban’s War takes places several months after the end of the previous book. The action this time centers around Ganymede, a major food source for the Belt colonies and one of the last remaining joint operations between Earth and Mars following a fragile truce established at the end of Leviathan Wakes. This uneasy peace is soon shattered when an alien creature appears on the moon and wipes out a contingent each of Earth and Martian marines. As the feuding governments attempt to sort through the confusion, signs of an even larger conspiracy emerge, as do increasingly volatile reactions from the alien protomolecule gestating on surface of Venus. The story this time unfolds from the point of view of four characters, with familiar face James Holden accompanied by newcomers Praxidike Meng, a botanist from Ganymede, Sargent Roberta “Bobbie” Draper, a member of the Martian Marine Corps, and Chrisjen Avasarala, a high-ranking official in the Earth’s government. While I was somewhat lukewarm in my feelings about the first novel, I found this installment a bit more to my liking despite still having some reservations. Story-wise, I thought this book was pretty good. Entertaining and action packed throughout, the book hit its stride early on and kept it pretty much throughout with the exception of two minor snags. The first of these snags was one conflict near the end getting resolved just a little too easily and the other was a tendency in the middle to use repetitive word choices per chapter only to have them just as quickly disappear. Overall though, while this might not have been the most thought provoking of novels, the story was fun and the series is beginning to get more complex as the intrigues expand the universe gets filled in as more key players begin to emerge. It seems to be on the verge of making the jump from a made for film or TV action/adventure series into something just a little bit more. As for the characters, I found them somewhat of a mixed bag. Expanding the cast to include more point of view perspectives was definitely a good move that made for a much better read. In particular I liked Avasarala, a tough as nails Indian grandmother who also happened to be one of the most powerful and competent people in the solar system. Her character simultaneously added much needed senses of levity, diversity, and control, not to mention some fantastic one-liners. Combined with Srgt. Draper, it was nice to see a pair of good female characters considering Naomi’s treatment in the first book (she fared a bit better this time around). We also got to know the rest of Holden’s crewmates a bit better, most notably Amos, whom I also really liked. I wish we got into the heads of these people a bit more, but I did get the sense that this will be happening soon, something that bodes well for future installments. Speaking of Holden, there’s just something about him I don’t react well to; he’s like a combination of Dudley Do-Right and Captain Kirk-lite that I can’t help but think of as a bro. Also frustrating is that the author had a tendency to diminish other characters when they’re around Holden to make him seem more impressive rather than write him up to their level; I just didn’t buy everyone around him so easily falling in line as a subordinate or suddenly morph from capable professionals to bungling underlings. I did like him a bit better in this novel than I did the previous, but he may be the reason I drop the series. Following the Game of Thrones analogy used to market the first book, I worry that I’m in the situation of being intrigued by the Song of Fire and Ice series but not being so sure about that Jon Snow fellow. Since James S.A. Corey doesn’t seem to have the same bloodlust for killing off main characters as George R.R. Martin, this may not end well for me. These reservations aside, the series was intriguing enough to bring me back (again) for at least one more book. This installment ended on a pretty big cliffhanger that I’d like to see resolved and now that there are a few characters I’m starting to care about I don’t mind throwing the next installment, Abaddon’s Gate, into my library wait-list. If I stop reading there, I’ll let you know; otherwise I’ll do an update later on in the series. With six novels currently out in print and three more planned, I’d like to post about other books as well. The Trillium spree continues! This beer actually came out the same day as Never & Again, so my reasoning for this one was that I might as well pick it up since I was in line anyway. Description: A double IPA with pinot gris juice added mid fermentation and dry-hopped with Galaxy and El Dorado. For more details, the brewer notes are available here. The four pack of cans cost $22.20, seemingly the brewery’s high mark for this format. Enjoyed out of a snifter glass. Appearance: Poured a hazy golden/straw yellow body with a fizzy thin white head. Smell: Reminiscent of a slightly sweet white wine with some hoppy bitterness lingering in the background. Taste: Started out mellow and juicy with lightly sweet citrus zest coming in just before the pinot gris juice began to stand out. The finish was dry, highlighted by more of the pinot gris and a moderate grassy hop bitterness that left a slight resinous aftertaste. The beer settled in quite nicely as it sat in the glass with lime zest, grassy hops, and the added juice blending together seamlessly. Mouthfeel: Medium bodied with pleasant little bubbles throughout. Hype Factor: Elevated. While the focus of its release day was no doubt Never & Again, there was some excitement around this offering as well. Overall: Very good, where this beer really shined for me was in its balance and cohesion of flavors. It showcased the added ingredient remarkably well and in way that enhanced the beer rather than merely push the flavor. I think it’s pretty safe to say they nailed this one. I haven’t had much time to hang out at my local breweries lately, so it was nice treat to stop by Idle Hands Craft Ales on my home from work the other day and grab a quick flight. At $13 for four 5 oz. samples it was a bit more costly than committing to a full pour, but I was in the mood for some variety. 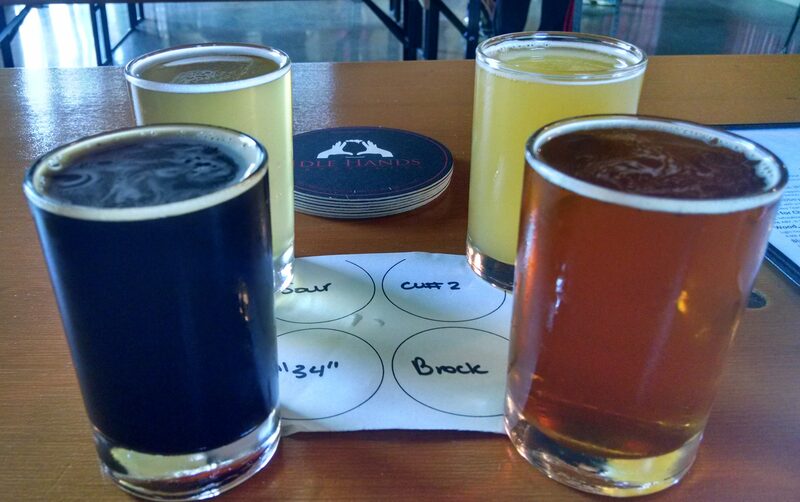 Fortunately for me there was a good mix of styles available and I was able to try out a pretty diverse set of brews. I started out with Brocktoberfest, a 5.2% marzen, to help get into the spirit of the season. A pretty solid offering, it was approachable and very easy to drink featuring a nice mix of sweet and bready malts with a slight lingering bitterness on the end. Next up was Sig Sour, a hazy straw-colored dry-hopped sour ale. Coming it at only 4.0%, this little beer had a lot of big flavors. It started tart and sour with a lemon/lime combo and finished with a blend of sweeter citrus fruits. Really, really good. Beer number three was Change Up #2, the second installment of their rotating IPA series. I really liked the first batch, but wasn’t quite as into this one. It had a surprisingly pronounced bready malt taste upfront that caught me a bit off-guard, especially with the description saying they had cut down on the malts for this version. The mildly bitter citrusy/grapefruit finish wasn’t bad, but ultimately this wasn’t quite my thing. Finishing out the flight was 34, begrudgingly my co-favorite of the day. Brewed to celebrate the retirement of Red Sox slugger David Ortiz (of whom I am not exactly a fan), I can at least appreciate the brewery’s enthusiasm for baseball. This 6.7% porter had a thick, smooth body and some really great notes of chocolate, roasted coffee, and sweet malt. It was very good and ended the flight on a real high note. I’ll just associate it with a different number 34, like Brian McCann or Nolan Ryan, instead. 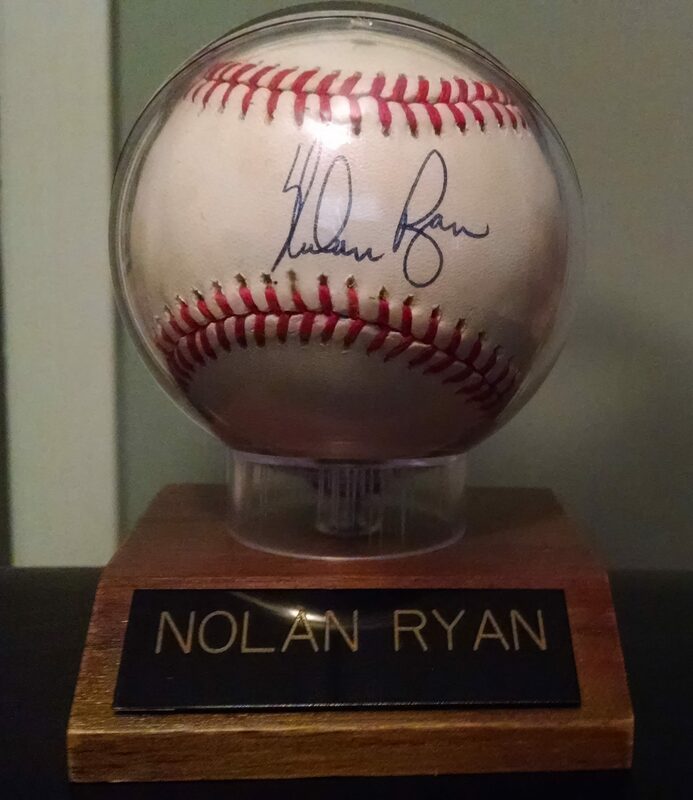 Yeah, that’s it – Nolan Ryan. I guess I kind of lucked out in having to work on Columbus/Native American Day, since I was downtown for another highly anticipated Trillium release. Apparently I jinxed myself in the Sigtebrod review, though, as there was indeed a line for this beer when I showed up at the brewery. Description: Another Trillium collaboration brew, this time made in cahoots with California’s Monkish Brewing Company. For a quick run-down, the beer was a double IPA aged on mangos and hopped with Columbus, Citra, Simcoe, and Amarillo. Check out this link for the full story and specs. The four-pack of cans cost $22.20 and came with a limit of two per customer. That was on the higher end of what I am usually looking to spend, but I was curious to try this. Appearance: One of the most interesting bodies I have come across yet, it looked like a super cloudy and murky glass of orange juice. A thin yellow-tinted head formed as the beer poured but quickly dissipated. Smell: Sweet tropical fruits with a little bit of heat on the end. Taste: Started out tasting like orange and mango juice, but then a huge rush of bitter hops quickly took over the beer, giving it a sharp, spicy finish. After letting it sit in the glass for 5-10 minutes, the beer happily mellowed out a little bit. The juiciness became more pronounced and bitterness subdued somewhat, though it retained a spicy bite at the very end. Honestly this beer tasted rather green to me and right out of the can it reminded me of my first time dry-hopping a homebrew with way too much Simcoe and tasting the hop-infused near-trub. Mouthfeel: It had a thick juicy body that was nonetheless decently carbonated throughout the drinking experience. I could also swear I felt the rawness of the hops numbing my throat after the first few sips, a sensation that went away as the beer warmed up. Hype Factor: High, perhaps even sky-high. This was a beer people had been anticipating for months and it drew a bit of a crowd. As for myself, I’d been eager to try out Monkish for some time now and since I don’t really have the time or resources to get into trading this was my best chance to do so in the foreseeable future. I will admit these initial expectations were tempered somewhat as I gave in to curiosity and read the initial highly polarized Untappd reviews, but knowing what a fickle lot us beer enthusiasts can be I took those with a grain of salt and kept an open mind. Overall: Despite reading some of the initial reviews, I was not prepared for the intensity of the hops which hit like a roundhouse kick to the beard. That said, I get the feeling underneath all that there is a good beer here, it’s just way overshadowed by that raw, off-balance finish. Not sure if this extreme bitterness is a hallmark of Monkish or not, but I kind of wonder if maybe this got either over hopped (blasphemy!) somewhere along the line or released a bit too early. Or maybe I just have sensitive taste buds. I’m going to optimistically go with the reasoned consensus of reviewers and hope that more time in the can will do this beer some good. I know how people feel about aging hop-forwards brews, but this one might be an exception. Perhaps I’ll do an updated review in a month or so. This book ranks among my all time favorites and has been an election year tradition ever since I found my copy at a San Francisco antique store back in 2003. Told through a series of articles, field notes, diatribes, and ultimately taped conversations with his editor (following a nervous breakdown in November), Fear and Loathing on the Campaign Trail ‘72 is a narrative of Thompson’s experiences and impressions covering the 1972 Democratic primaries and Presidential election for Rolling Stone magazine. True to the author’s style, it contains a lot of colorful language, strong opinions, and several misadventures. Frank Mankiewicz, campaign director of eventual Democratic nominee George McGovern, once called the book “the least factual, most accurate account” of the process; which given Hunter’s huge emotional investment, not to mention penchant for wild tangents and exaggeration, sounds about right. If you’re at all interested in American politics or government this book is a must read. For a general overview, the story begins in December 1971 and follows the path of South Dakota Senator George McGovern en route to winning the hotly contested 1972 Democratic Presidential nomination. By appealing to the more liberal wing of the party and mobilizing an enthusiastic following among young voters, his campaign’s superior grassroots network allowed him to defeat a pair of old-guard establishment favorites while fending off a surprise challenge posed by a far-right demagogue. After surviving an “Anyone But McGovern” challenge at the party convention, he seemed poised to deny Richard Nixon a second term in office. Shortly following the nomination, however, the wheels began to fall off the campaign. A scandal over an unpopular Vice Presidential selection with a history of shock therapy and lukewarm support from the defeated party establishment killed enthusiasm among new-found supporters and traditional Democratic voting blocs alike. As a result McGovern suffered a crushing defeat, winning only in Massachusetts and Washington, DC, as Nixon cruised to reelection following a historically low voter turnout percentage. Reading this again made me wish that Hunter was still alive to give his thoughts on our current political situation. 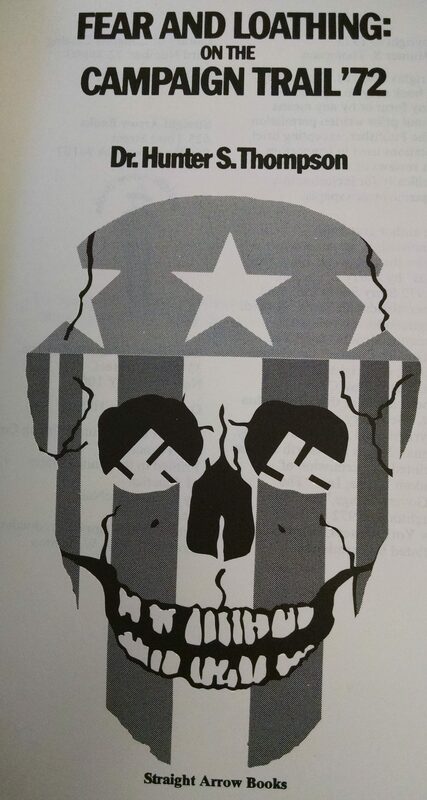 Having boasted of writing “some of the most brutal and hateful caricatures of Richard Nixon ever committed to print, in this country or any other (399),” what would he have to say about this year’s crop of Republicans? Would he have felt the Bern despite his misgivings about the Democratic Party? With these thoughts in mind, I will close with a few quotes that struck me as particularly relevant this year. A new Trillium brew and a slow day at work meant I once again took a walk to Fort Point on my lunch break for release day. I can’t say enough how much I enjoy having them nearby, especially now that weekday lines seem to largely be a thing of the past. Description: A collaboration between Trillium and Danish brewers Amager Bryghus. 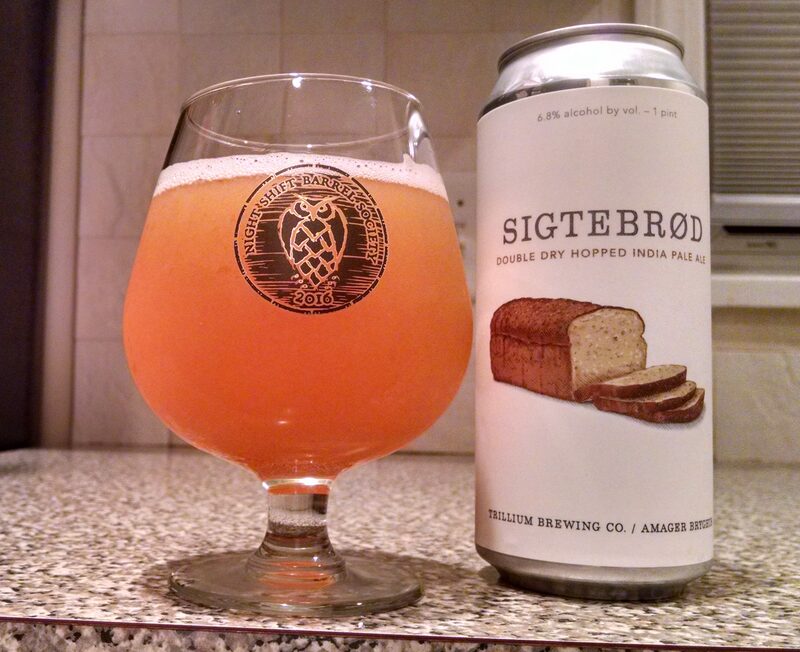 A detailed description of this beer can be found on Trillium’s website, but to summarize they created an IPA inspired by Danish wheat bread. To achieve this goal, they added wheat flour to the mash and added wildflower honey and tangerine peels for good measure before dry-hopping with Citra and Amarillo. The four-pack of 16 oz. cans cost $20.20, on par with the rest of the Trillium’s dry-hopped offerings. 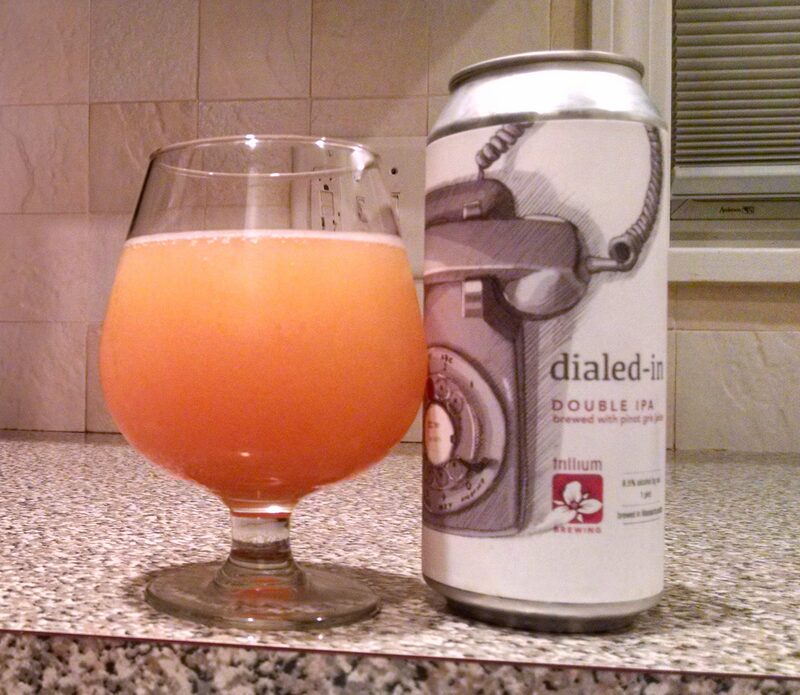 I drank the can for this review out of my usual snifter glass. Appearance: Poured a light amber/yellowish body with a thin and frothy white head. Smell: Trace amounts of sweetness; mostly citrus fruit and honey. Taste: True to the inspiration, there was a noticeable presence of bready malts throughout, taking on a bit of a wheaty character about halfway through. Also popping up around the halfway point was some of the aforementioned sweetness in the form of orange and tangerine juice. The beer closed with a very dry, crackery malt finish featuring a honey-infused bit of heat joined by a lingering bitterness. Mouthfeel: Probably on the higher end of moderate, but there were times when it felt like the added honey gave this brew just a little extra bit of thickness. Moderate carbonation kept the beer bubbly throughout. Hype Factor: It’s from Trillium, not to mention another a collaboration, so there was definitely elevated excitement and some buzz surrounding this release. Overall: A very good beer, it reminded me a bit of Artaic though with slightly more pronounced bready malt and slightly less honey, I like how this beer had a different flavor profile than the usual juicy IPAs (not that there’s anything wrong with those), it’s just nice to see the brewery go in another direction on this. I’m unfortunately not familiar with Amager Bryghus, so I wonder if some of that can be attributed to their influence. October is here! Fall is in the air, the MLB playoff are upon us, and Halloween is right around the corner. 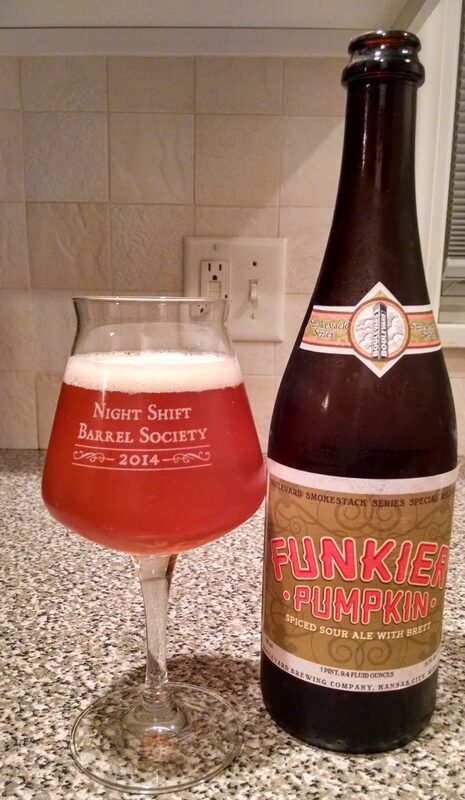 October also signifies the one month out of the year in which I’ll drink pumpkin beer. Although I am not going to repeat last year’s blind pumpkin tasting, which turned into something of a chore towards the end, I will pick up a few here and there that seem worth trying out. Description: The brewery’s website offers a variety of notes about the beer here, but to sum it all up what we have here is a subtle pumpkin/spice ale designed to feature Boulevard’s house brettanomyces strain. The beer came in a corked and caged 750 ml bottle that I believe cost around $13. I poured this offering into a teku glass, just to mix things up a bit. Appearance: A thick, foamy off-white head sat atop a golden orange/amber body. After wiping away condensation, I could just barely see through to the other side of the glass. Smell: Light bretty smell with a hint pumpkin in the background. Mouthfeel: Light bodied and bubbly on both my tongue and back of my mouth. I found the little bubbles really intensified the funky flavors of the finish. Hype Factor: I remember really liking Boulevard’s Tank 7 Saison, but otherwise I had no preconceived ideas or expectations going into this. Picked it up because it caught my eye. Overall: This was a pretty good beer. It was a bit intense drinking a whole bomber of it by myself, but overall I enjoyed the experience. Definitely in a different league than most of the generic, mediocre pumpkin ales I sampled last year, I liked that it had something different to offer.